With the White House announcement that First Lady Michelle Obama will be in China on a solo international trip from March 20 to March 26, her first to that nation, numerous media outlets have contacted the National First Ladies Library to place her historic journey within an historical context. This popular incumbent First Lady’s forthcoming visit to Asia’s largest country will find her in Beijing for four days, Xi’an for one day, and Chengdu for two days. In the last century and a half, fourteen American First Ladies have visited China. Some went before their husbands became Presidents of the United States, others went there while they were incumbent First Ladies and still others made their first journey to the vast nation only after leaving the White House. Several made numerous trips to China before, during or after their tenure as presidential spouses. 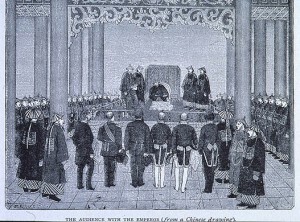 It covers a period of tremendous change within China, as it went from a nation ruled by dynastic families, still feudal in nature, to a republic during which conflict immediately arose between those seeking to transform into into a socialist state and those favoring a more democratic one. In this multi-part series, the National First Ladies Library will offer the first narrative about the experiences of these fourteen women in China. Unfolding chronologically, it provides a sense of developing US-Chinese relations over a century and a half and how what was once an entirely mysterious culture, so long referred to by westerners as the “Orient”, has evolved into a 21st century society. It was while making her unprecedented world tour with her husband, former President Ulysses S. Grant that Julia Grant became the first (former) First Lady to visit China. The Grants landed in England on May 28, 1877 and from there traveled the globe, treated as touring American monarchs in the British Isles, France, Belgium, Switzerland, Denmark, Egypt, Greece, Italy, Russia, Austria, and Germany, Burma, Singapore, Vietnam, and Thailand. In both closed carriages on land or aboard the U.S. ship Ashuelot by water, the Grants made stops in Hong Kong, Macao, Woosung, Shangkai, Pei-ho and Chefoo. Julia Grant became the first of numerous other First Ladies to marvel at what she called the “great Chinese wall,” at the base of which she picked up pebbles and shells as souvenirs, as well as having the record of her visit discreetly painted on the wall. Along the way, they were feted with endless ceremonies, cannon salutes, welcoming banners, flying flags, thousands of swaying, lit paper lanterns, torchlight parades, and overwhelming firework displays. 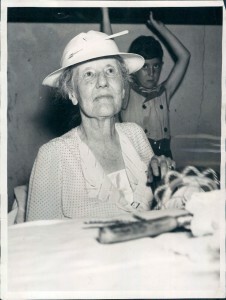 This fancy American matriarch was a bit of a novelty for the Chinese. While aboard a rustic flatboat, she glanced into her mirror and noticed three members peering into an open porthole window as she was methodically dressing in her many layers of clothing and decorating her extravagant hairstyle. 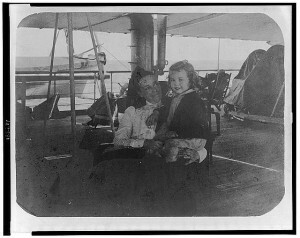 Never a teetotaler, Julia Grant admitted that her flatboat junket was made all the merrier by bottles of claret wine. In Canton, there was so much formal ceremony and so many officials she was expected to meet, the former First Lady was “greatly disappointed….as I…did not have an opportunity to see anything of the city.” Still, she proudly recorded, she did “get one afternoon for shopping.” The highly acquisitive Mrs. Grant managed to select, “at first sight,” jade pieces, enamel boxes, embroidered silks and “best of all,” two massive blue cloisonné vases. 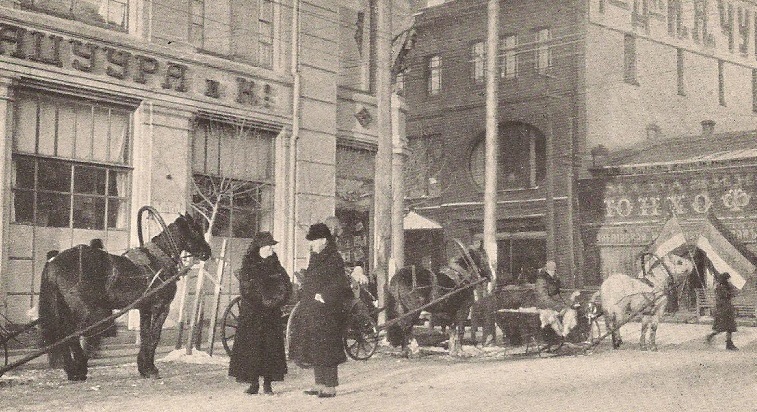 Julia Grant’s most interesting exposure to the Chinese culture was in Tientsin. Although permitted to take tea with the legendary Viceroy Li Hung-Chang aboard ship, she was otherwise sequestered with women. In light of her status, however, the former First Lady was honored at a special luncheon hosted by the Viceroy’s wife, an unprecedented gesture, and it proved to be the first time that she was even seen by the six other women guests. 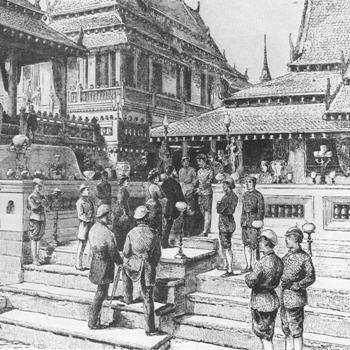 Former President and First Lady Ulysses and Julia Grant arriving to meet Siam’s King Chulalongkorn at his Palace. 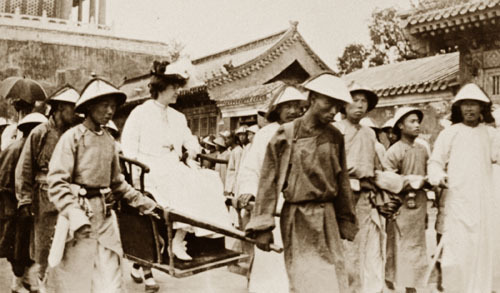 Perceived as still holding some form of inherent power, Julia Grant was conveyed through the streets of Tientsin as a potentate, seated on a chair which was raised on a platform and carried by four men, veiled from public sight by a yellow silk curtain. With the grand flourish of trumpets, her chair was placed on the stone vestibule and the curtains drawn, where Lady Li helped her rise and proceed into the court dining room. There was a mutual fascination between Julia Grant and Lady Li when it came to clothing. For the first time in her life, Mrs. Grant saw a woman in a pair of pants, the pair worn by Lady Li being made of brown velvet brocade over which she wore a pearl and jade-encrusted tunic. Julia Grant removed her sizable collection of jewelry, a stickpin, earrings, necklace, rings and brooch and handed them over to the Viceroy’s wife who was curious to examine the items closely. The meal was a mix of eastern and western custom, the food served on French china accompanied by Chinese chopsticks. Noticing how the Chinese women ate nuts in between courses, Julia Grant took to the habit and introduced it in the United States at dinners she would thereafter host. After the meal, Lady Li staged a Chinese pantomime performance for her guests. So curious about how it was all proceeding, the Viceroy himself was spotted peering into the room – until noticed, when he vanished from the sight of the women. The high and wide walls of the Forbidden City left Julia Grant feeling “safe indeed if on the inside,” unlike the dusty, unpaved streets outside of it. In Peking, she was not invited with her husband to meet the young Prince Kung or the Prince Regent. 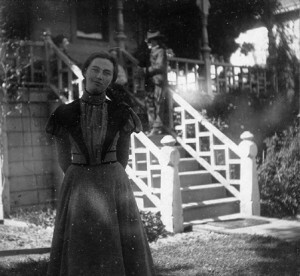 On February 11, 1899, the day after Lou Henry Hoover was married, the newlyweds set sail from California for China, where her mining engineer groom Herbert Hoover would be working. 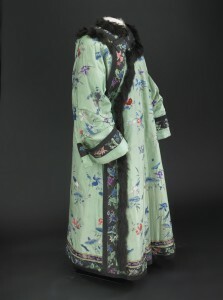 Upon settling into a home in Tientsin, she began an intensive study of her imminent life in the new country – the culture, the regional differences, and the history, as well as the language. Even learning several different Chinese dialects, Lou Hoover spoke Chinese more easily than her husband and often translated materials for him. 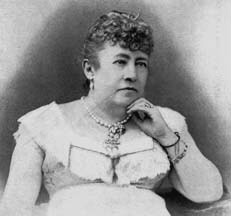 She also began making trips around the country, not only to Peking but some of the interior provinces. 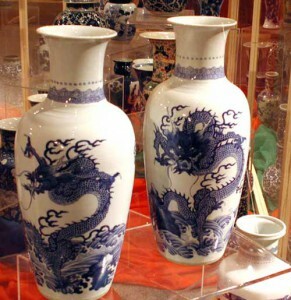 Her interest in Chinese porcelains prompted a lifelong passion for collecting samples of various period porcelains, especially of the Ming and K’ang periods. One year into their residency in Tientsin, in June of 1900, the Boxer Rebellion broke out. This was a famous series of violent attacks on and murder of foreigners in a portion of the port city where they predominantly resided by bands of native Chinese who resented the growing foreign influences on Chinese society. Throughout the crisis, Lou Hoover displayed a brave calm, helping build protective barricades, caring for those wounded by gunshots, and assuming management of a small local cow herd to ensure fresh dairy products for those living within the protected area. Eventually troops from the U.S., England, France and Russia arrived and patrolled the foreign-resident region along with civilians, like Lou Hoover who worked guard duty. Before, during and after the Boxer Rebellion, Lou Hoover made her way around China by bicycle, but during the conflict she also learned to fearlessly use a pistol as a means of self-protection. Despite their home being riddled with bullets and shells, the Hoovers remained unharmed. 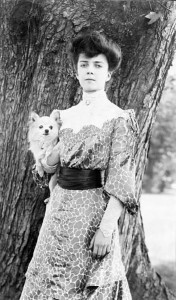 Although Lou Hoover never completed the book she’d begun about living in China, in 1909 she did author a definitive article on Tzu Hsi, the Dowager Empress of China. 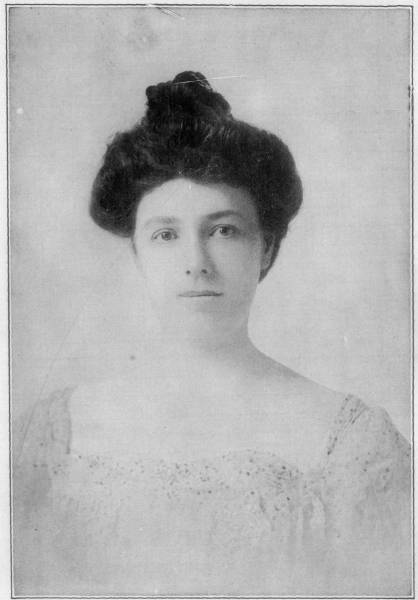 With more of a taste for fearless adventure than most First Ladies, and a wanderlust which never abandoned her, Nellie Taft made it her business to get into China and explore alone, leaving her children with her husband, then in Manila serving as the American governor-general of the recently-colonized Philippine Islands. The atrocities of guerrilla fighters against U.S. military forces had upset the delicate peace that had begun to settle on the islands and this, along with the intense heat had set her on edge. 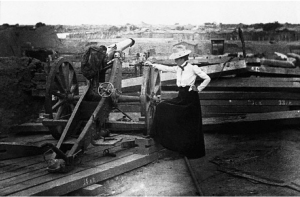 A year earlier, upon her initial arrival in Asian waters, Nellie Taft was talked out of her determination to explore Shangkai because the Boxer Rebellion was then raging, and she was able only to stop briefly in Hong Kong, before heading on to Manila. 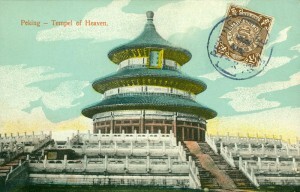 When she arrived at the Temple of Heaven, Nellie Taft witnessed this famous place of meditation for generations of Chinese emperors still being used as barracks for U.S. troops who had landed in China to help protect American citizens during the Boxer Rebellion. Since Tzu Hsi and her retinue, having retreated from the Forbidden City during the fighting, was about to return to her palace, Mrs. Taft was able to look briefly through some of the royal residences. For this future First Lady, however, failing to closely inspect ancient historic sites during her “very busy days sightseeing” was more than compensated for by the chance to buy “oriental artifacts” at great prices. Besides her purchases of numerous bolts of embroidered silks, Nellie Taft was pleased to be gifted with a three-foot brass Buddha and a blue porcelain dog from American officials. 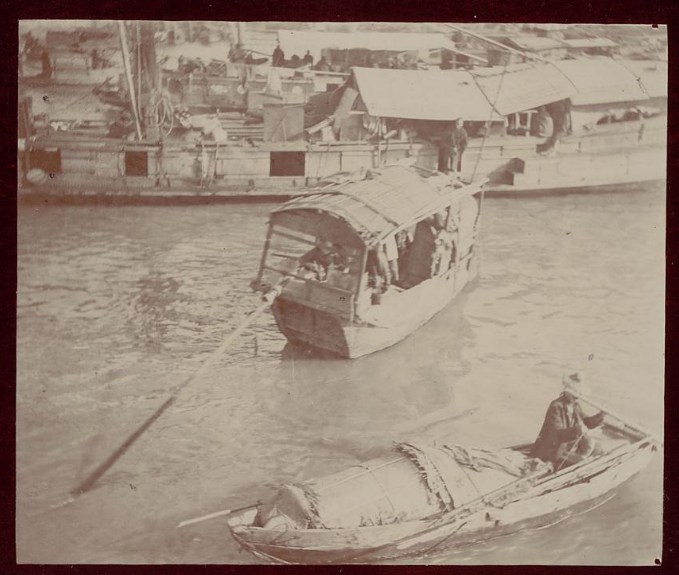 Instead of remaining in Shangkai for the steamer that would return her to the Philippines, Nellie Taft decided to use the time for a houseboat excursion down the Yangtze River. Not only did she find the local residents on the shore hostile in their stares at her, but she learned that the clay mounds which her vessel often shored upon were graves. 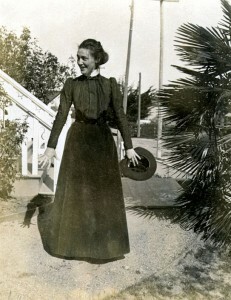 Edith Roosevelt visited China as part of a multi-nation tour she made in February 1924, proceeding there from California to Hawaii, and afterwards visiting Japan. Accompanied by her adult son Kermit, she entered a nation which was functioning under a new anti-royalist republic. Mrs. Theodore Roosevelt was considerably uncomfortable in a land where a societal fracture was occuring between nationalist forces and those seeking to enforce a communist form of control without any freedom of religious choice over the vast and varied population of China. 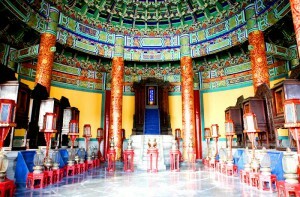 In Peking, she made the rounds of the typical western tourists, from the Forbidden City, to the Summer Palace of the legendary Empress H’sui, the latter site prompting her memory of the rich and ornate tapestries, fabrics, scrolls and other gifts the monarch had sent her in the White House. Some nine years later, Edith Roosevelt made a second but far briefer visit to China in the last days of December, 1932. President Herbert Hoover had appointed her son, Theodore Roosevelt, Jr. as Governor of the Philippine Islands. 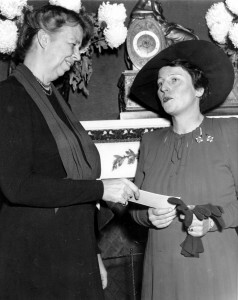 Nearly two months earlier, however, Hoover had been defeated for re-election by the husband of the former First Lady’s niece-by-marriage, Franklin D. Roosevelt. Determined to visit the Philippines as her late husband had always hoped to do, Mrs. Theodore Roosevelt first stopped in Shanghai, China before proceeding on to Manila. While in Shanghai, the former First Lady turned down many invitations to private dinners and receptions from both Chinese and foreign political figures but at the last minute changed her mind and accepted one from Mr. and Mrs. Sun Fo, the son and daughter-in-law of the late “Father of the Chinese Republic” Sun Yat-sen.
Of course, Edith Roosevelt’s famous stepdaughter Alice Roosevelt Longworth had been the first in the family to tour through China. In her heyday as “Princess Alice” this Presidential daughter had not only met the old Dowager Empress during her tour of several Asian nations, but had not at all been intimidated by her. When this First Daughter married in the White House in 1906, the Empress sent her crates full of lavish, exquisite gifts, from bolts of embroidered silk cloth to porcelain urns to lacquered black wood chests to enameled boxes to multiple pieces of carved jade and ivory jewelery. The greatest gift from the Chinese Empress which Miss Roosevelt long after remembered, however, was not an object but a living being. It was a little Pekingese dog which the First Daughter named Manchu. 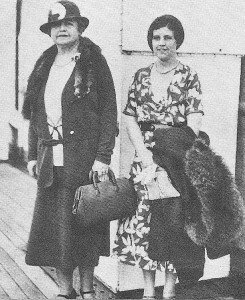 “Pekin[g] is the most fascinating city I have ever seen,” wrote former First Lady Edith Wilson to her brother Randolph during her stay there in June of 1929. 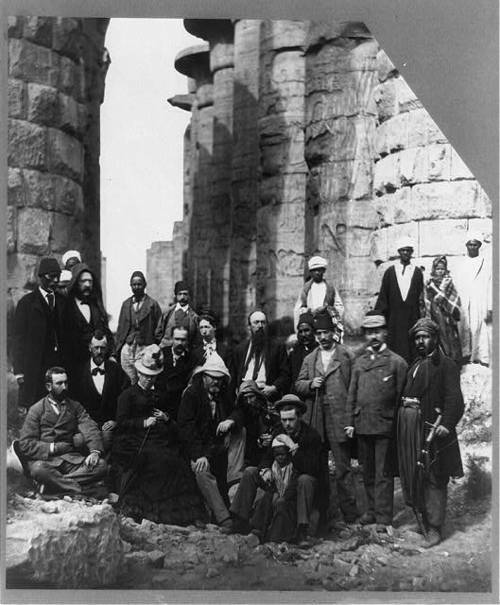 Her visit to China was part of a multi-nation voyage she made with a cousin who was working on the rebuilding of a Japanese hospital he helped establish. Landing at Shanghai, she and her party proceeded to Peking by train. Ensconced in a large corner hotel suite, she had a breathtaking view of the blue-tiled roofs of the Forbidden City’s buildings which entranced her. 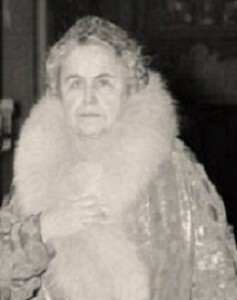 Much of her time was spent being feted as the widow of the man who had proposed the League of Nations, and she was the center of attention at nearly two dozen feasts of twenty-course meals hosted by diplomats and wealthy Chinese business and social leaders. While game to try all types of exotic foods, some of it made her ill. Rallying to full strength, she made acute observations in her letters about the radical difference between the squalor of the impoverished majority and the luxuries afforded the elite class. From Peking, Edith Wilson proceeded to Mukden, Manchuria where her world voyage would continue, her next port-of-call being Toyko. 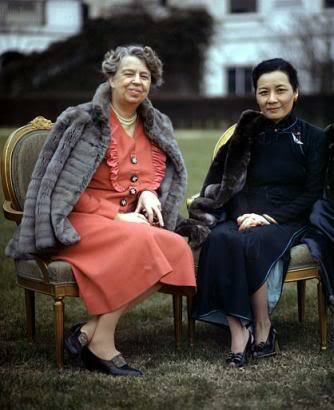 If there is any First Lady that might have been expected to visit China, it would be Eleanor Roosevelt. During World War II, she became the first incumbent First Lady to make overseas trips, and do so without the President, travelling by air and sea to the British Isles, the Caribbean and the Pacific, as a representative of the Red Cross. As a former First Lady, both in her official capacity as a representative of the United Nations and as a private citizen, she was at home around the globe, visiting nations in Southeast Asia, the Middle East, South America, Eastern and Western Europe. 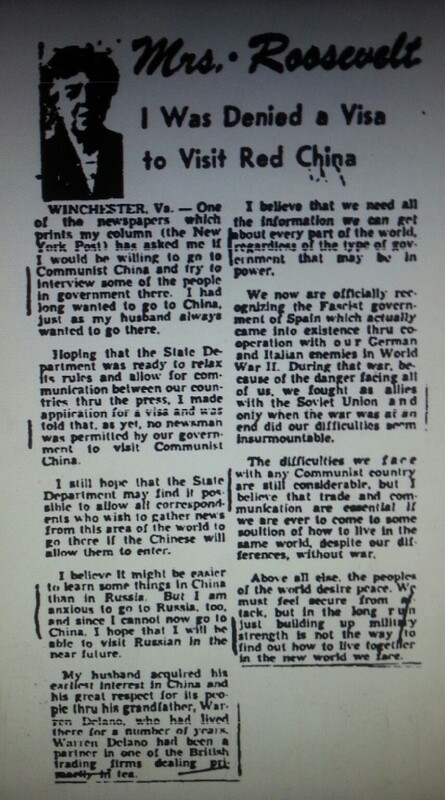 With the Chinese Communist Revolution leader Mao Zedong establishing the People’s Republic of China on October 1, 1949, however, and the retreat of nearly 3 million nationalist Chinese with their leader Chiang Kai-shek to the island of Taiwan, however, the United States Department of State placed a firm ban on any travel to China by American citizens. Eleanor Roosevelt was eager to make the trip, but the State Department, then under the Republican Eisenhower Administration, refused to change its policy, adding that there was no way for the American government to ensure her safety there. Mao and his party leaders were also especially hostile to Eleanor Roosevelt. Since her days as First Lady, she had been a consistent supporter of the anti-communist nationalists and in that role, she had not only befriended but welcomed its leader’s wife, the overtly political Madame Chiang Kai-shek as an overnight White House guest with much publicity and fanfare. Thus, China remained one of the few important nations never visited by Eleanor Roosevelt. I found these articles about our First Ladies very interesting and would appreciate hearing about more recent trips taken by our “Ladies” in the future. A wonderful history lesson on the China trips of our first ladies! Looking forward to Michelle Obama’s experiences in China. Thank you so much for the blog!!! Part two, covering the 1970s and 1980s will appear on Monday, and part three covering the period since the 1990s will appear on Wednesday. Many thanks for your message. We will be posting the second part on Monday, beginning with Pat Nixon’s famous trip to China in 1972 and then on Wednesday those who visited in the 1990s and 200os. Thanks for your support!